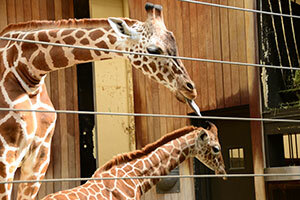 The Milwaukee County Zoo is happy to announce the name of its newest giraffe is Zola. Zola is a word from African origin meaning “to love.” The Zoo invited visitors to choose their favorite name for the youngster through online voting on the Zoo’s website beginning May 18. The Zoo received almost 6,000 votes from 35 states. Five different name choices were offered. Zola was born on April 26 to first-time mom, Marlee, and dad, Bahatika. She is nursing from mom, and was just recently introduced to her outdoor yard. Today, May 26, marks her one-month birthday. The Zoo thanks all those who participated in helping choose a name for Zola!